tartine. noun. 1. 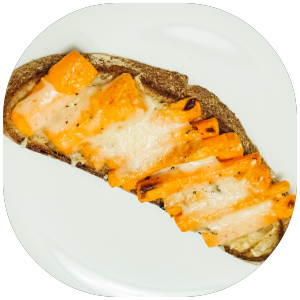 A French open-faced sandwich, especially one with a rich or fancy spread. 2. Ground-breaking bakery in San Francisco, California. I love tartines – both the open-faced sandwiches as well as the hip café and bakery in SF. The first love is related to my fondness for toast. The second love is related to my fondness for good toast, which often requires good bread. And Tartine Bakery has some of the best dense, rustic, natural-yeast loaves I’ve ever tasted. Its walnut loaf, which I finally had the pleasure of tasting recently, is so chewy and moist from the long sourdough aging process that it takes an extra-long time to toast. 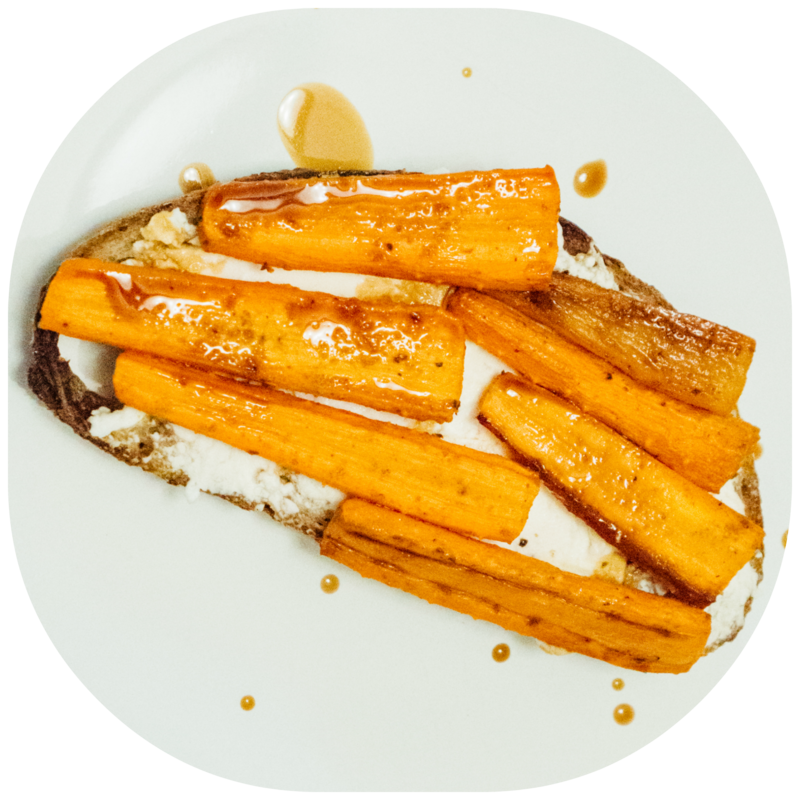 The resulting toast will knock your socks off with its complexity. It needs no more than good butter, and maybe some berry jam (as my colonial husband would request). Toast is important in my life both because I love bread and I also enjoy flexible dining. 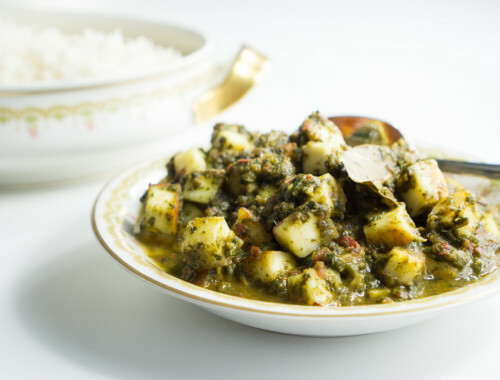 I don’t often plan my meals; I amble into the kitchen, poke about the cabinets, and graze throughout the day, like a small dog discovering some new and interesting edible scrap that fell below the stove. If there are the last scrapings of a carton of vanilla ice cream left in the freezer, I might quickly spoon them into my mouth before regret sets in…and if there is a last cheese cracker pushed to the back of the cabinet, I will likely be delighted to discover the intruder and quickly pop it into my mouth. It all depends on how I feel, and what I feel hungry for. So if I bought strawberries and don’t feel much like washing them, there is a good chance that the strawberries will grow moldy before I remember to eat them. Herbs might wilt. Root vegetables, purchased in a virtuous moment, will likely grow old and flabby from being ignored and banished to the back of the refrigerator. But bread can always be wrapped tightly, frozen, and resurrected in seconds, transformed into glorious toast, waiting to be topped with foodstuffs sturdier and longer-lasting than the usual refrigerator residents—canned sardines, jarred red pepper spread, cheese (likely with the mold surreptitiously sliced off), a hastily-poached egg from the carton I purchased when I experimented with a cookie recipe weeks ago. Better yet if the bread is not just basic supermarket-quality, but reflects the careful feedings of good flour and water and multiple long fermentations at specific temperatures that yield a product more deserving of the name “the staff of life.” Such bread might inspire you, as it did me, to create a whole meal around the bread. And the day I purchased my loaves of walnut and porridge bread from Tartine, I did just that. I drove home from Tartine, with my accidental purchases in tow. (How does one accidentally purchase two enormous loaves of bread, you ask? My husband would say that I was the only person he knew who would be susceptible to such a whim.) 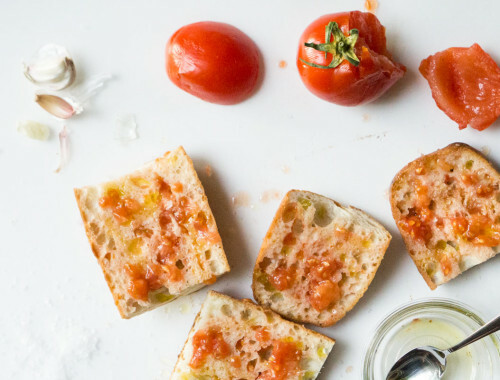 As I sped down the freeway, I started daydreaming about making tartines with Tartine’s still-warm bread, filling up my car with its sweet fermented grain smell. My mind wandered to piles of roasted vegetables, covered with sheets of broiled Gruyere cheese. So I made a pit stop at my local grocer (Trader Joe’s) on the way home. Then, I went home and poked around my fridge. Brussels sprouts, still clinging to freshness! Perfect. I washed them, shed their tired outer layers, halved them, and let them drain with the other produce in a colander. Into the bowl the Brussels went, along with halved carrots, shiitake and button mushrooms, a glug of olive oil, and salt and pepper. Half of the carrots were tossed with cumin. The other half…didn’t I still have a box of thyme in the fridge, from the last time I made pork ragu? Yes, and a few lone stems were still salvageable—great! 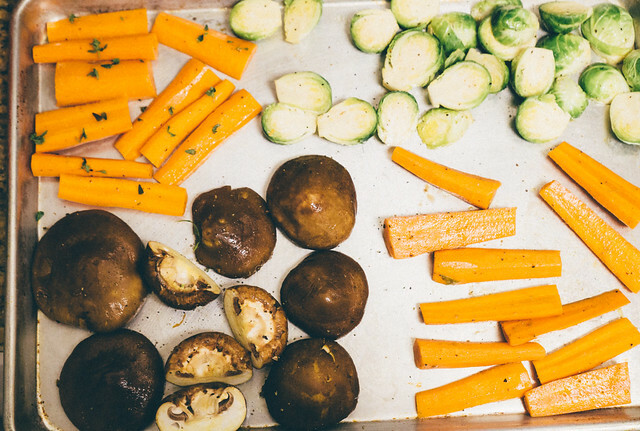 The vegetables and mushrooms were segregated by type and seasoning on a sheet pan, then roasted. 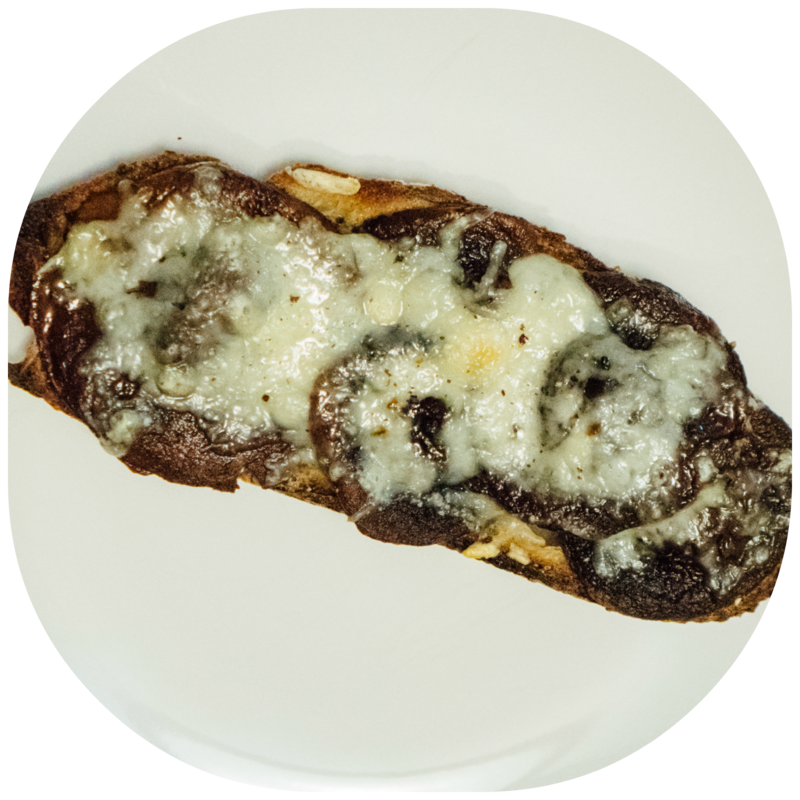 About half an hour later, I sliced and lightly toasted the bread, piled the caramelized veggies and mushrooms on top, and topped them with Gruyere cheese for broiling. (Or reversed the cheese-veggie process and nixed the extra broiling, if I was using goat cheese). It was a good dinner. Surprisingly filling, compelling, highlighting the complementary sweetness of roasted vegetables and toast, heightened by the lip-smacking savoriness of the cheese. My husband said it was one of the top five dinners I’ve cooked this year, but he has a lovely tendency to exaggerate when it comes to compliments. Still, this was a very easy weeknight dinner, requiring very little prep time, involving maximum flexibility (you can use whatever vegetables/herbs/cheeses are readily available), and allowing you to ingest a large amount of healthy vegetables in a rather delicious and (somewhat) healthy way. Lightly oil a baking sheet, preferably with extra-virgin olive oil or a flavorless oil, like canola. Toss the carrots, Brussels sprouts, and mushrooms in a bowl with enough extra-virgin olive oil just to coat. (Start with about 1 Tbsp. of oil, and add more as you need.) If you add too much oil, the roasted vegetables might become too oily and heavy. Add in pinches of salt and freshly-ground black pepper to taste, and toss again. Reserve half of the carrots. Place the vegetables (minus the reserved half-batch of carrots) and mushrooms on the baking sheet, spreading them out so that there is open space and they do not touch. (If the vegetables get too crowded, they might steam instead of roast. You want the caramelization from roasting here.) If your baking sheet gets too crowded, either put the extra vegetables on a separate baking sheet, or bake in batches. On the baking sheet, sprinkle the carrots with thyme leaves. To the remaining carrots in the bowl, add about a tablespoon of red wine vinegar and 1/8 tsp. (or more, to taste) of cumin. Toss to coat. Place the remaining carrots on the baking sheets along with the other vegetables and mushrooms. Roast the vegetables in a 400 degree oven for about 30 minutes. 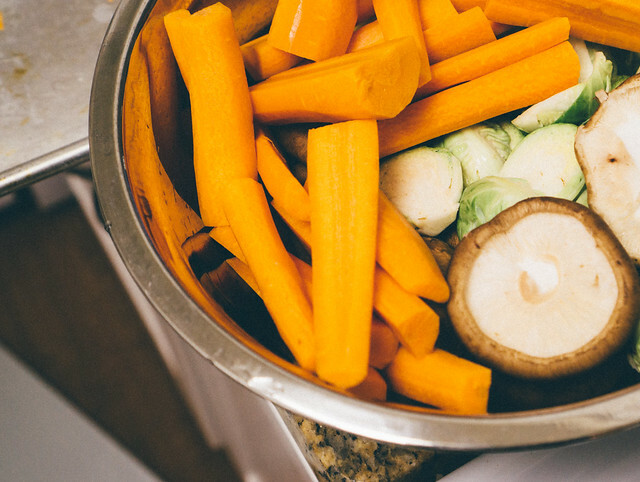 About halfway through the baking time, stir the vegetables gently to ensure they roast evenly. 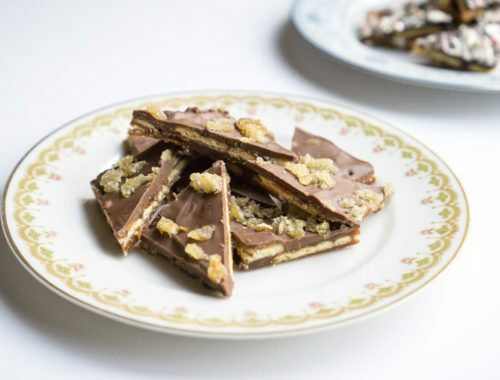 Add more baking time as needed. When the vegetables look nicely shriveled and browned, remove them from the oven. As the vegetables cool, slice and toast the bread. Top with vegetables and cheese as you prefer, and broil as necessary. 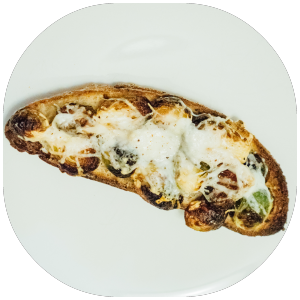 Brussels sprouts tartine: Pile the Brussels sprouts on top of a piece of toast. Grate some goats-milk Gouda on top. Broil. 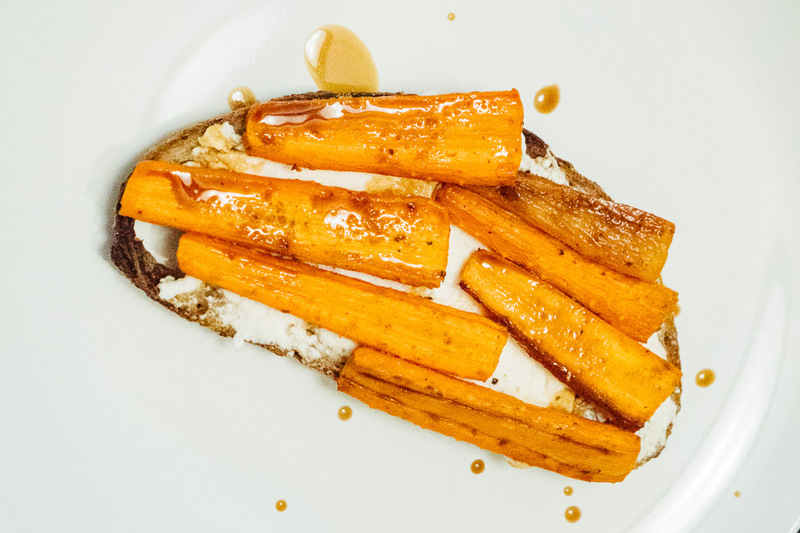 Cumin-roasted carrot tartine: Spread a piece of toast with goat cheese. Top with the cumin-roasted carrots. Drizzle some good balsamic vinegar on top. Avocado toast: Thinly slice a ripe avocado, and fan out over toast. Top with ghost pepper chili salt and perhaps some flakes of red pepper. Roasted shiitake mushroom tartine: Pile roasted shiitakes or other mushrooms on top of toast. Top with generous amount of grated Gruyere cheese. Broil. 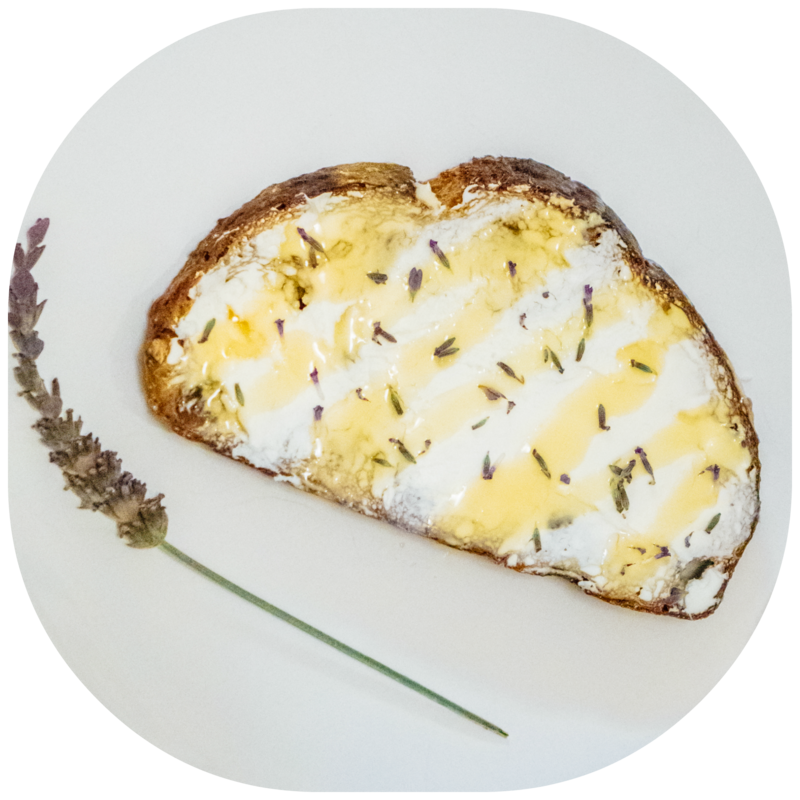 Goat cheese, lavender, and honey toast: Spread a piece of toast with goat cheese. Sprinkle with dried or fresh lavender buds. Using a squeeze bottle, drizzle with honey. 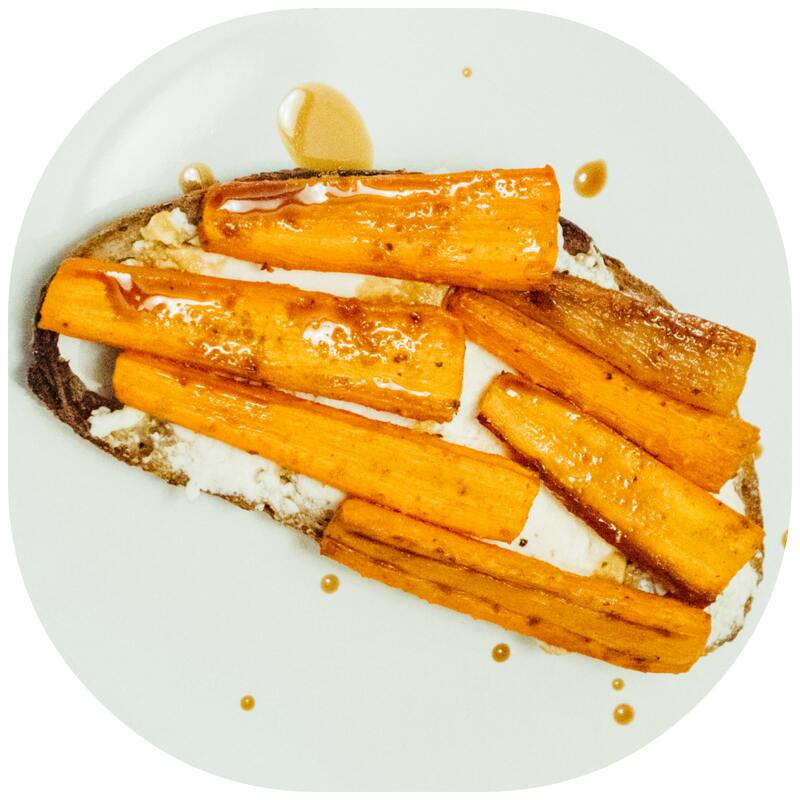 Thyme-roasted carrots tartine: Pile the thyme-roasted carrots on top of a piece of toast. Top with a generous amount of grated Gruyere cheese. Broil. 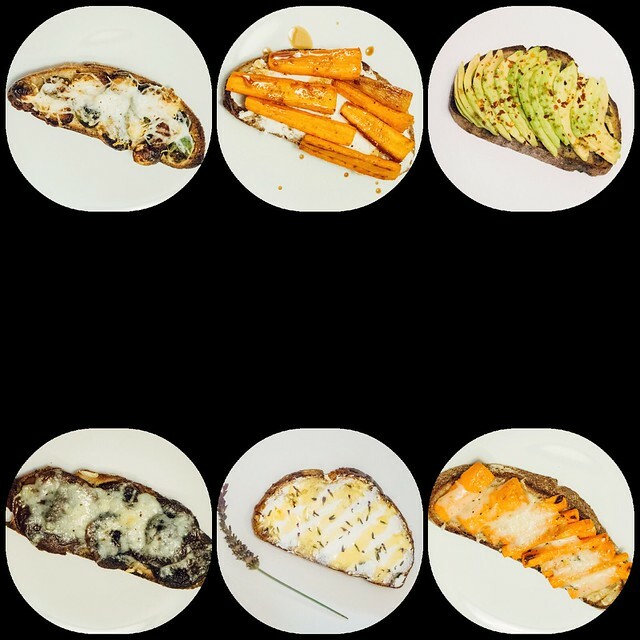 Any leftover vegetables or mushrooms can be refrigerated for several days and reheated by placing directly on lightly-toasted bread, covering with desired cheese, and toasting/baking until the cheese melts and the vegetables or mushrooms are warmed up.